Some say the Porsche 911 Carrera GTS is just an options package with too little to distinguish it from a Carrera S. Others say the GTS is the drivers' 911 to buy if a GT3 is too much car. So which is it? We found out. Imagine Charlie Daniels fiddling with one hand, while tapping out the lyrics to "The Devil Went Down To Georgia" on a stenotype with the other. That's what nykelharpa players look like. Anyone short of Doctor Octopus might find the nykelharpa a complex affair, and yet plenty of Swedes play it with surprising regularity. It's sort of like ordering a new Porsche. Porsche extracts legendary profits from buyers working its options sheet like Josefins Dopvals rocks the slängpolskas, spending weeks color-coordinating and carbon-fibering, stacking tens of thousands of dollars atop the base price to assemble the perfect, made-to-order 911. The Carrera GTS scoffs at the very idea. A single checkbox delivers a swell-looking, 3.8-seconds-to-60, 190-mph Porsche, so buyers can spend their time driving instead of memorizing feature codes. Choosing among rear-drive GTS coupe, all-wheel-drive Carrera 4 GTS, or Cabrio versions thickens the plot somewhat, but those in sunnier or snowier climes deserve a shot at the perfect 911 too. Intrinsically, however, the only choice is two-wheeler hardtop. Introduced in the 911's 997 model generation, the Carrera GTS muscles in between the Carrera S and GT3 in Porsche's now-19-strong lineup of 911 variants. Cynics have derided the GTS as a packaging exercise, and they're right. The question is, does that package provide more value than the retail sum of its options? Let's run it down. The Carrera S Powerkit adds 30 hp to the 3.8-liter flat six's output (peak torque stays the same). The kit comes with hotter cams and a novel, two-channel intake plenum with six flaps that open and close based on engine speed and throttle position. My grasp of fluid dynamics is spotty, but engineers say this variable resonance induction system creates pressure-wave oscillations that help pack the combustion chambers with life-giving air. A kind of low-level forced induction, if you will. Moreover, the intake ports have been resurfaced via some sort of abrasive compound, to help boost intake efficiency. Talking about this process gets the engineers pretty wound up, so you know it's something special. In effect, driving a Powerkit-equipped car is kind of like turning up the midrange knob on your dad's old Marantz stereo. Where the standard Carrera S's torque curve swells to a vivid finish at its highest revs, the Powerkit shifts the band downward slightly. So, what you may give up in back-of-the-tach drama, you get back in a bit more potency at the center of the rev range. It comes standard with the sport exhaust, which, when fully alit, sounds like pure malevolence. Is it worth it? Well, paying $17,800 atop a Carrera S for some extra lower-end brightness always felt like a stretch, but packing the kit into the GTS is slightly more palatable. The GTS also comes with the Sport Chrono package, which bundles all the fun stuff: PASM continuously-adjustable dampers (the suspension's lowered by 10mm), dynamic engine mounts, and the Sport Plus button, which stiffens the suspension, raises the stability-control threshold to allow more slip angle, sharpens throttle mapping and tells PDK to shift quicker and closer to redline. Personally, I think ordering a 911 without Sport Plus is like buying half a car. The GTS also gets the wider track that's standard on the Carrera 4S; that's something you can't get for any price on a Carrera S. Years ago, the 911 "turbo look" option was a way to give the base car more muscle in the haunch region. On the GTS, the extra girth just looks cooler. The wider arches and 36mm extra width give it incrementally more road presence, and – like the 4S – it's possible a slightly higher lateral G number over the base model as well. At Big Willow, the GTS has more than enough grip to carry ludicrous speeds through turn two's double apex, and that mind-twisting windup of turns 8 and 9. Not to mention, the GTS also comes with the Carrera Turbo's 20" center locking hub wheels, which you can't get on a Carrera S, and the same size shoes as the 4S (and GT3): 245s in front and 305s in the rear. Transmission. While you'll probably at least want to want the seven-speed manual, that maddeningly brilliant optional PDK just keeps mocking us with its competency in every aspect – in both manual and automatic modes. GTS buyers going PDK also get an electronic rear diff. (That e-diff runs off of the PDK's processor, so you can't get it with the manual.) It engages the rear locker so accurately, driving e-diff and mech-diff cars back-to-back reveals a real difference in rear stability, both on initial turn-in and in quick direction changes. The fully-mechanical part may feel more familiar, but the e-diff is very, very clever. On the inside, the GTS is a vision in Alcantara. I happen to like the look and feel of faux-suede. You can choose leather instead. Outside, you get black trimmings and smoky-eye headlamps. And the sport seats offer a good mix of road-trip comfort and track-force posterior enfoldment. What's not included in the GTS package? Porsche's Dynamic Chassis Control (PDCC) is a trick system that employs hydraulic actuators to counter-load the antisway bars as needed for flatter cornering without sacrificing general ride quality. Sport PASM drops the ride height by 20 mm on firmer springs. Ceramic composite brakes are a must for all-day track flogging. Total extra cost for all of those, plus PDK: upward of $17,000, sending the GTS coupe right up to base-GT3 pricing. On the road, the GTS is like any other 911. Brilliant when pushed, docile when stuck behind a civilian in a Camry. 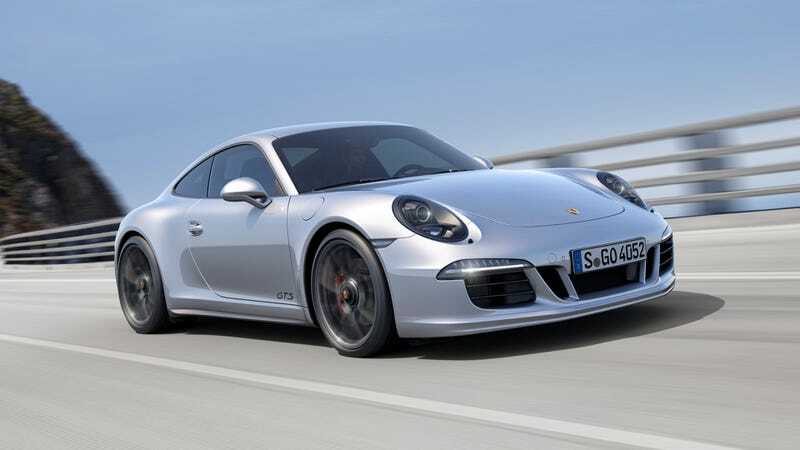 It's "usable performance" personified, and there's not much at canyon speeds to distinguish the GTS from a Carrera S. On the track, the GTS is sure-footed and fun, delivering the kind of accuracy and confidence we've come to expect from the 991-series 911. Let's face it. These days, the world's last rear-engined sports car is in the hands of a technocracy bent on giving lay-drivers full access to its performance envelope. As such, the 911's true brilliance emerges the closer it gets to its ridiculously high limits, and so a 911 that never sees a racetrack is like a pair of titanium kevlar skis that never leave the bunny slope. Should you buy a base GT3 instead? Only if you're a track rat. The GT3 is in another league, performance-wise, but it's not for daily use by the soft of spine. In many ways, the Carrera GTS remains the 911's enthusiast's conscience. It's close enough to the GT3 to keep enthusiast buyers interested, and yet, it's a sports car whose accessibility just broadens its appeal. It's not as special as a GT3, as the cynics have a point – it's largely just a spec'ed up Carrera S. But it's got practically all the things an enthusiast driver would order, plus the visual gravitas of extra rear track width, at, Porsche reps say, a 10-15% discount over a similarly-equipped Carrera S.
Then, if you still want to add leather air-vent slats or a color-matched key fob or personalized door-sill guards, that's all on you. MSRP (starting price, not including $995 destination charge): 911 Carrera GTS, $114,200; Carrera GTS Cabriolet, $126,100; Carrera 4 GTS, $120,900 (coupe), $132,800 (cabrio).